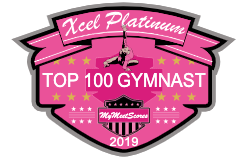 17 9.700 Buono, Kaci Connecticutt Gymnastics Academy LLC T.D.N.I. 33 9.650 Marshall, Cecilia Paradise Gymnastics T.D.N.I. 62 9.600 Haven, Anna Gymnastics Learning Center T.D.N.I.